Ok, so I know its not the Fourth of July yet. However, some may remember last year I said you can see the fireworks from my deck. Not much but some and Hemi was so excited to see them. So I figured I would make an attempt to go this year and take him. However, I wanted to be sure he could handle it. Well a small town near me was having a live outdoor concert, follow by a small fireworks show. I decided to take him there to see how he does before I get downtown in a large crowd and traffic and if he is scared we can't get away. So I drove there and parked in the parking lot, across the street from the park, there was some other people there so I figured we would have a pretty good show but we had front row seats. I backed in the truck so we could sit in the bed and then we could also make a pretty quick get away. OMG Look at all the people, think anyone will come and love me up. Yeah, Hemi was super popular, kids and ladies were coming by and loving him up. One lady even stop and bought a $2 glow in the dark necklace from a street vendor. You know the ones you get for kids and stuff. He was so thrilled and happy. I figure the people alone would wear him out. He already had a 3 mile hike. I swear he leads a interesting life for a lab. Holy cow dad, look at that. I would have shot more but I decided to sit back, relax and enjoy the show with my boy. Going to be a good 4th of July. Then yes I know I am lucky, I know a lot of dogs are scared of the fireworks. However Hemi is not the ordinary dog. That's hilarious! Mine don't even notice the noise but I have no idea what they would do if they saw one. Maybe we will have to give it a go this year. Last edited by Labradorks; 07-02-2014 at 01:25 AM. 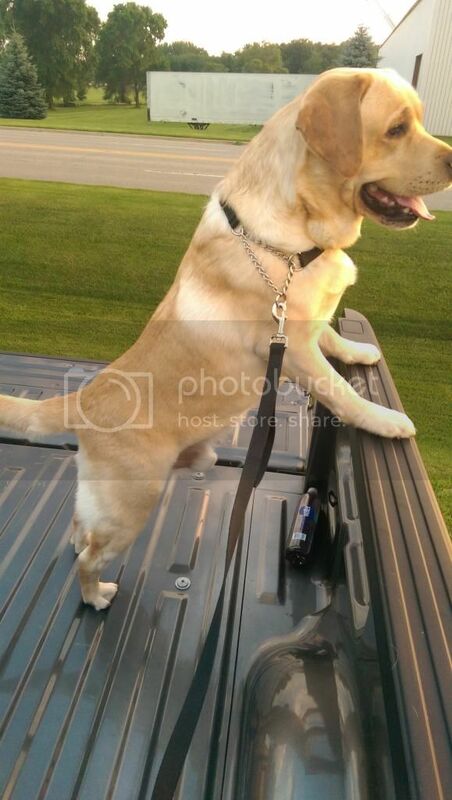 Those photos are awesome and Hemi is so adorable!!! Incredible that he is comfortable with the noise of the fireworks. 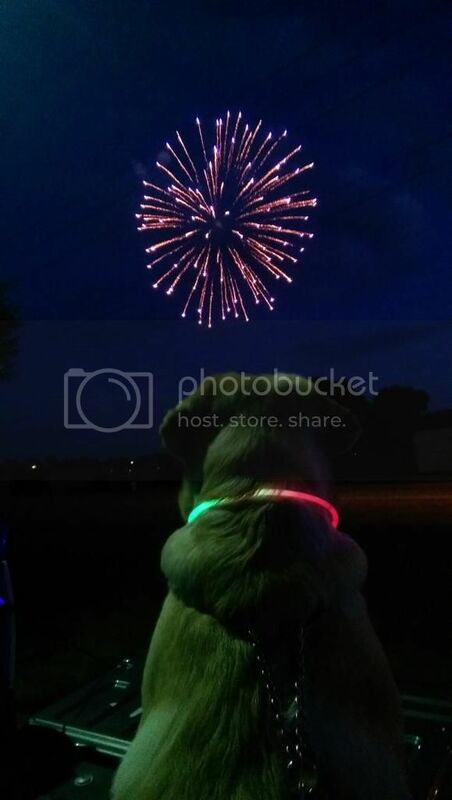 The first photo of Hemi watching the fireworks is amazing! Looks like it could be a magazine or book cover. Glad he enjoyed the fireworks, not just tolerated them. Those are great pictures; thanks for sharing. Hemi's obviously not just another pretty face: he is cute, wise, talented and very special, I believe. 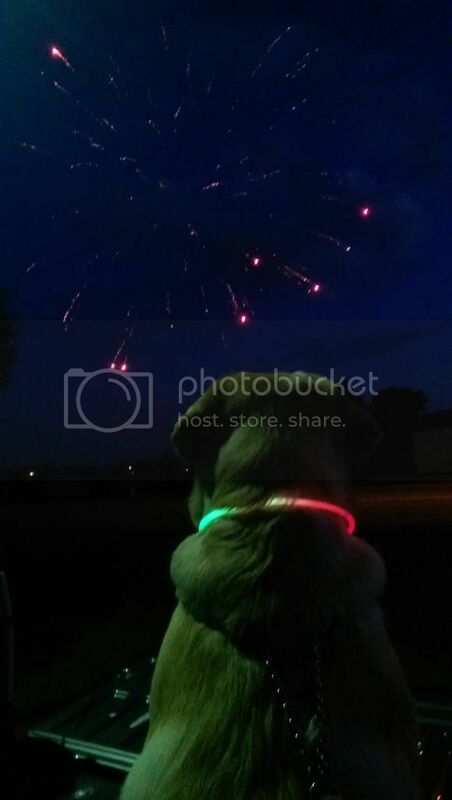 Love the pics where I can sort of share the fun he had watching the fireworks. It reminds me of a funny story I had with Lynn some time ago: across the street from the apartment building where I live, there's an old brewery with a nice restaurant and in the summer the garden with tables is open and you can have your brew there. Really neat. One day there was a party there that finished with fireworks. 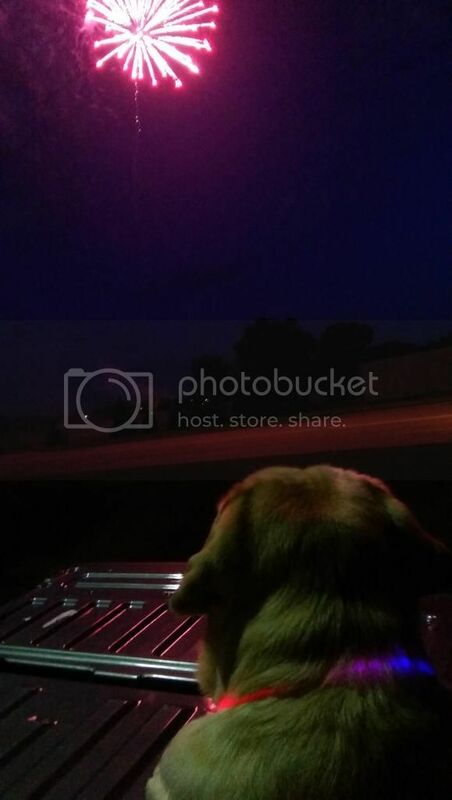 Couldn't find Lynn anywhere inside and finally there she was sitting on the balcony, watching the fireworks, obviously having a blast while I could hear the barking and whining of scared and frustrated dogs from the neighboring apartment buildings. Guess she was a very special dog too. Good for Hemi! Good for you too! Looks like you both had a good time. Love the first pic! 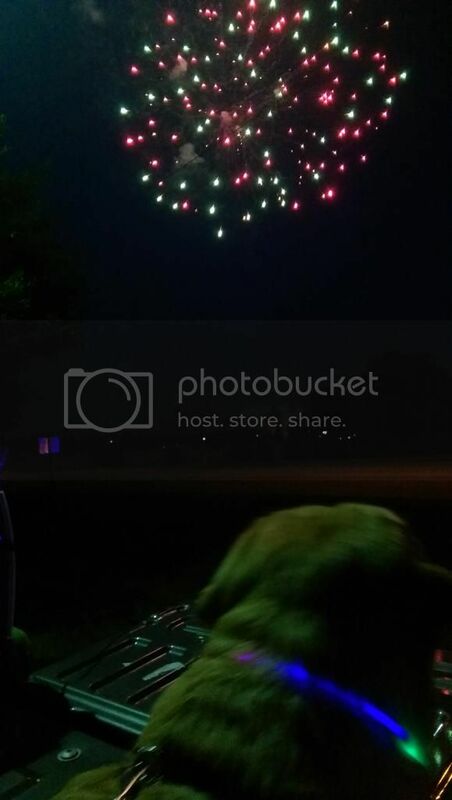 He is so cute enjoying the fireworks. 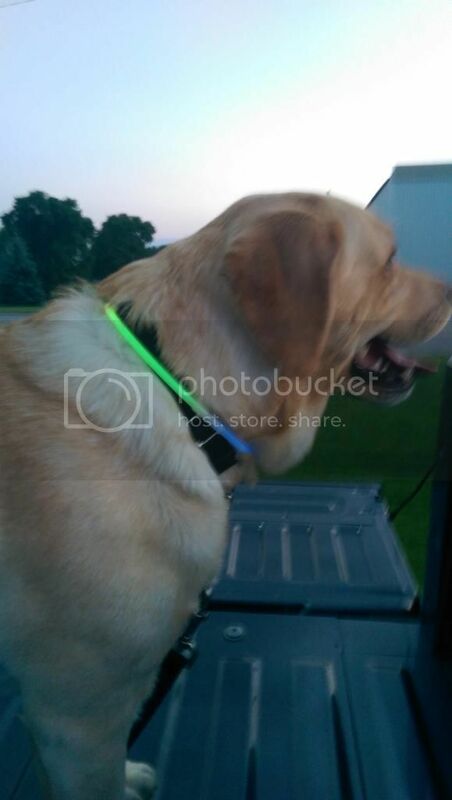 Love that a stranger bought him a glow in the dark ring so he could be a part of the party too. 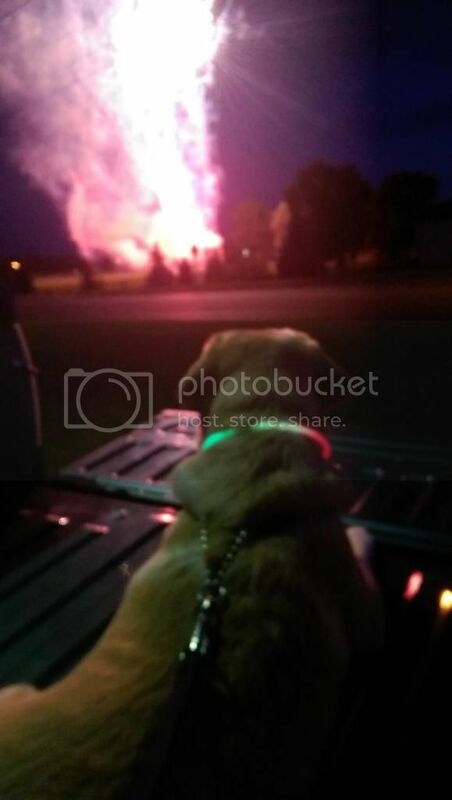 Cute that Lynn decided to enjoy the fireworks too. Bobby isn't afraid of fireworks either. He does watch but probably because he can't fall asleep due to the noise. Hemi is a rockstar wherever he goes! How kind of someone to buy him a glow in the dark necklace.